The coast of Georgia comprises a vast array of wetlands ranging from freshwater non-tidal and tidal wetlands to estuarine wetlands, or salt marshes. 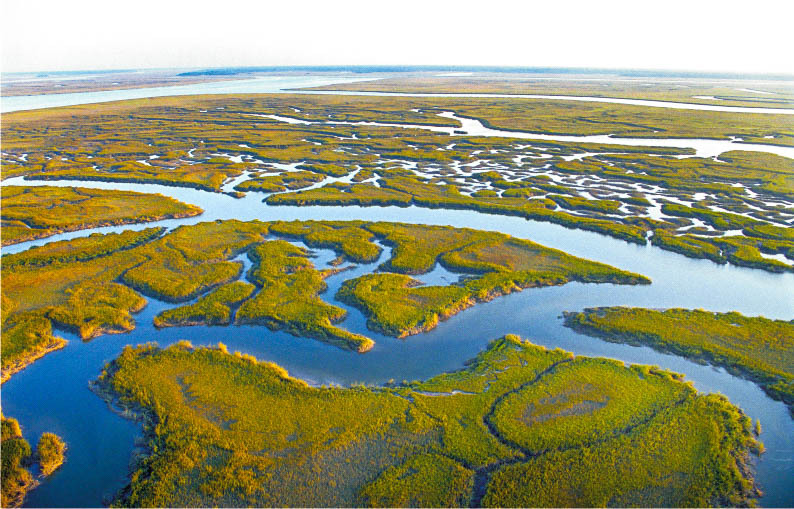 With approximately 100 linear miles of coastline, Georgia boasts approximately 368,000 acres of estuarine tidal marsh. These marshes are ecologically significant as habitat for aquatic organisms, including fish, shellfish, waterfowl, and other wildlife species. In addition to serving as habitat for specific organisms, salt marshes also function as feeding grounds for terrestrial vertebrates, as a buffer to protect against coastal storm surge, and as a natural filtration system to improve water quality, transform nutrients and retain sediment. The Coastal Resources Division has been engaged in wetlands work including projects such as marsh dieback, living shoreline implementation, National Wetland Inventory updates, wetland functional assessments, and estuarine wetland condition assessments. Click here to be redirected to the CRD Living Shoreline webpage.